Tuesday was “Make America Work Again” day at the Republican National Convention. But this day wasn’t about making America work again for working people. This was, as always with conservatives, all about tax cuts for the rich and corporations, deregulation of oil and coal companies (and other paying corporate clients) and austerity cuts in the things government does to make people’s lives better. 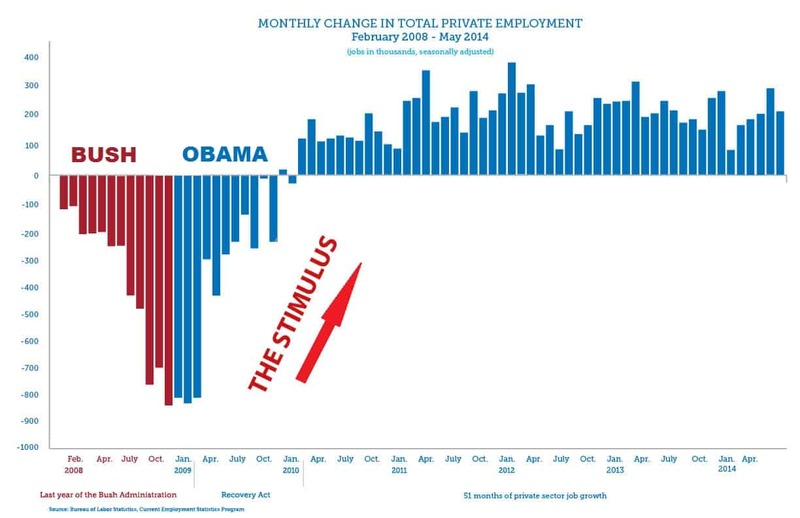 Truth is, the economy has added 14.8 million private-sector jobs since the big Bush/Republican downturn of 2008. The Obama years have delivered anemic economic growth, the lowest labor-force participation rate in 38 years, and job-killing regulations and legislation like Obamacare. These policies are crushing middle-class families, and a Hillary Clinton presidency would merely be an Obama third term that would deliver the same poor results. Donald Trump is a successful businessman with a solid record of creating jobs and the experience we need to get America’s economy up and running … and get Americans working again. Businessman Andy Wist from Brooklyn, who has a waterproofing company, said that after eight years of President Obama he doesn’t see the American Dream. Donald Trump “is a leader … He will make America work again.” He didn’t say how. Speaker of the House Paul Ryan is best known for his austerity budgets, the practice of literally taking money out of the economy to kill jobs and growth. His budgets demand cuts in Social Security, even privatizing Medicare. Ryan’s budgets make it impossible to invest in America. Ryan and Republican worldview, government spending bad, austerity. But after the stimulus passed the Republican strategy since 2009 has been to vote as a unified block to obstruct and sabotage anything that might make the economy better, and then campaign for office on themes of government not working, and the economy not getting better. And here they are, using “Make America work again” as a theme at the convention. Calculated. Cynical. May, 2014: Obama: GOP has filibustered 500 bills. October, 2013: Government shutdown over funding ObamaCare. This had a direct cost of $24 billion, reduced fourth-quarter GDP growth from 3 percent to 2.4 percent. And for a finishing touch, just this month the Congress left for the summer, having done nothing to fight the Zika Virus or help with mosquito control. It calls for a “pro-growth tax code.” This is codespeak for “tax cuts for the rich,” also known as “trickle-down economics.” The idea is that you redistribute society’s money to a few at the top, and they will use the money to give jobs to the peasants. But after Bill Clinton raised taxes the economy boomed, and after ‘W’ Bush cut taxes the economy tanked. Really tanked. Now Republicans want to do more of that. Go figure. Then the platform calls for “A Competitive America.” By “competitive” they do not mean reducing the power of monopolies or breaking up the big banks. No, it calls for reducing high corporate tax rates and “regulatory burdens and uncertainty.” On top of that, it calls for a territorial” corporate tax system so corporations that move jobs, production and profit centers out of the country won’t have to pay any taxes at all. On top of that, Trump has called for letting corporations off the hook with an extremely low tax rate on “deferred” taxes on profits held in offshore subsidiaries. Corporations owe more than $620 billion in taxes on these profits, but would get to keep most of that. What about honest corporations that didn’t dodge their taxes using offshore subsidiary schemes? Too bad for them. And the government? It might be owed $620 billion-plus. But too bad, the Wall Street shareholders get to keep it. Next up, “A Winning Trade Policy.” It’s hard to argue with this entire section that begins, “International trade is crucial for all sectors of America’s economy. Massive trade deficits are not.” The platform calls for trade agreements that protect U.S. interests and U.S. sovereignty and tough enforcement of violations of existing agreements, saying, “we cannot allow foreign governments to limit American access to their markets while stealing our designs, patents, brands, know-how, and technology. We cannot allow China to continue its currency manipulation, exclusion of U.S. products from government purchases, and subsidization of Chinese companies to thwart American imports.” It calls for transparently negotiated agreements in the interests of American workers. In “America on the Move” the platform calls for an end to mass transit programs and “repeal of the Davis-Bacon law, which limits employment and drives up construction and maintenance costs for the benefit of unions.” It calls for public-private partnerships (privatization) as a means to fix roads and bridges. It calls for privatization of Amtrak and ending federal support for high-speed rail. It calls for getting rid of unions in the Transportation Security Administration. It calls for getting rid of laws that protect workers’ right to join unions, saying unions “limit workers’ freedom and lock them into the workplace rules of their great grandfathers.” It calls on states to enact Right-to-Work laws. It calls for eliminating the federal minimum wage. Finally the platform elsewhere calls for just abolishing the Internal Revenue Service (IRS). “Congress should make U.S. corporations pay the $700 billion they owe in taxes on their $2.4 trillion in profits stashed offshore. Dave Johnson is a contributing blogger for the Campaign for America's Future.